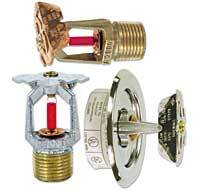 Fire sprinklers are made so they turn on when a fire raises the temperature near the sprinkler. Most fire sprinklers turn on at 155°F - 286°F. When a fire starts, a plume of hot gases rise to the ceiling. If a sprinkler is present, a glass bulb or solder link gets hot and at a specific temperature breaks releasing a cap and allowing water to flow onto a specially designed diffuser. The diffuser breaks up the water flow into carefully controlled droplets, which penetrate the fire plume and cool the burning material below its ignition point, thus putting out the fire with only sprinkler/s directly over the fire are operated. Why are fire sprinklers so effective? How reliable are fire sprinkilers? Do fire sprinkilers go off accidentally? Do fire sprinkilers go off all together? Typically a sprinkler discharges 60l/min. A fireman's hose on the other hand discharges 1000+ liters a minute. In general a sprinkler system will use between 1/100th and 1/1000th of the water used by the Fire Department. Even then, most things that get wet can be restored - but a pile of ashes is beyond hope. No. Only qualified and experienced contractors, with a state issued fire sprinkler contractors license, should install fire sprinklers. They will know how to design and install the system in compliance with national standards, which will ensure that the spacing is correct and the water supply adequate. 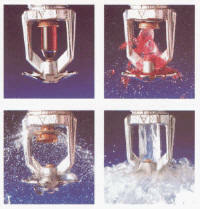 Also, fire sprinklers have different operating temperatures and flow patterns. You need someone knowledgeable who can select the correct sprinkler for each area of the structure.